Our recent data highlights what patients—especially those with chronic conditions—expect from their providers. Not surprisingly, they cite prescription support and associated check-in surveys as some of the key areas of support they need. 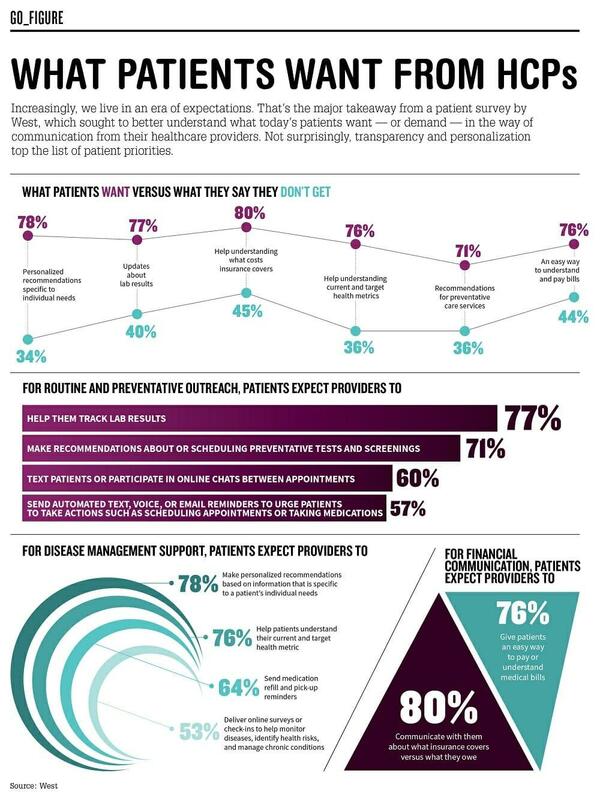 64% of patients expect to receive medication refill and pick up reminders. This is something we’re providing to millions of patients today through our mobile-first EngagedPatient™ solution. More than a simple reminder, these personalized messages (which can be initiated by a patient’s physician) can also provide guidance and support, such as proactive reversal messages and multimedia usage tips that make it easier to stay on a branded therapy. In fact, patients enrolled in EngagedPatient™ programs on average refill their prescriptions at a rate 35% higher and 74% faster, and stay on their branded therapy 27% longer compared to unenrolled patients. 53% want regular check-ins via surveys to help them manage their conditions. Providing real-world feedback on a patient’s experience with a therapy is a great way to keep them connected with their care team between visits. Our Patient Feedback solution systemically collects the voice of the patient and shares it with their individual providers for meaningful follow-up. HCPs appreciate having access to this useful patient communication tool; meanwhile, brands that include this approach as part of their promotional strategy see measurable NRx lift and may use the aggregate data to inform their overall messaging. While there will always be room for improvement within our healthcare system, we’re pleased to offer digital solutions that can help clear the way for more transparent, more meaningful relationships between patients, their doctors, and branded therapies—delivering better outcomes and a better patient experience. Join us in San Diego this coming May at the 2019 Biopharma eMarketing Summit. Be a part of the digital health movement and join a rapidly expanding network of leading digital marketing pioneers willing to share their own digital strategies that have transformed their campaigns and organization’s overall success in a unique, interactive, engaging 3-day summit! May’s unique event includes an interactive and dialogue-driven environment filled with panel discussions, engaging case-studies, roundtables, “TED-style” talks, keynotes, hands-on sessions and more providing unbridled access to best practices, valuable insights, tools and techniques for making the most of your marketing and sales campaigns. May’s event shares an exhibit area catering to both a senior-level pharmaceutical and medical device digital marketing audience of approximately 250 participants and 50. leading expert speakers. WANT TO ATTEND BUT NEED HELP CONVINCING YOUR BOSS? Let us help by generating you a custom message for you to send to your boss. Email it, talk them through it in person, tweet it to them 280 characters at a time: up to you. Let us help by generating you a custom message for you to send to your boss. Email it, talk them through it in person, tweet it to them 280 characters at a time: up to you. Register before 5PM ET Thursday May 2nd, 2019 & save $200. Share this with a friend or colleague!